My design dilemma is this. My front door always looks a mess and it’s the first thing you see when you come into my home. The kids always drop their stuff-shoes, backpacks, bags, toys right down by the front door when they come home. What can I do about making this space look nicer? Keeping your front or back entry neat is always a challenge when you have kids and husbands! Back East a lot of homes are built with what is called a mud room that is off the back entry. The concept of a mud room was to have a room where you could come inside and remove your muddy, wet boots and coats and not dirty the living spaces. Most of us here in California don’t have the luxury of a mud room so we have to come up with other ways to organize the clutter. 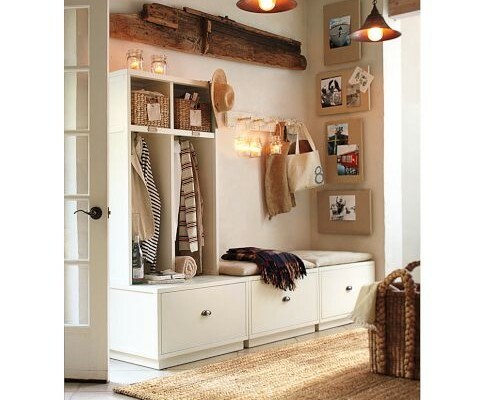 First look at your entryway and determine what kind of space you have where you could create a storage area. Analyze the types of items that you need to organize. Do you need containers, boxes, and hanging space? Design the area in an attractive cohesive way that complements the rest of your room/home. If there is room for a piece of furniture consider purchasing an entry storage bench. Pottery Barn has a nice one. Their Brady 4-piece double bench entryway system is perfect for organizing the entryway. The unit has room for hanging jackets, drawers for toys, shoes, etc., bins for storing school supplies and a bench where you can sit and remove your shoes. They offer several different options and different sizes of units. You can add more hooks for additional directly on the wall. Decorate the space around the unit with wall art and framed photos and add interesting pendant lights for style and adequate light. Now the space is organized and attractive not just a mound of clutter. If space is limited you can still achieve an organized area incorporating shelves, using large baskets and decorative hooks that can be found at any hardware store. You might even search for vintage pieces at local antique shops. Just be sure to decorate the space so it blends in with your home décor and becomes an attractive area that complements your home. Cabinets-to Reface or Replace? That is the question.